Winter's Mouth (previously known as Frozen Fang), is a steep, snowy mountain in the northern section of the The Island. It is part of the Snow Biome. The most common creatures here are Argentavis and Sabertooths. Mammoth, Woolly Rhino and Direwolf roam the slopes, but are more common the closer one gets to Whitesky Peak. Rex spawns are plenty on the west side of the mountain, down the hill, leading to the river and there is a very rare chance that Spino can spawn on the river and cause an onslaught, going up the hill, leading to the mountain. However, Daeodon packs often roam any of the slopes, and a Yutyrannus and its pack of summoned Carnotaurus frequent the northern and eastern (and occasionally the western) slopes as well. Together with Whitesky Peak in the west, Winter's Mouth delinates the snow biome of The Island. Southeast of the mountain is Frozen Tooth. Prior to v243, this region was known as the Frozen Fang and was not covered in snow. 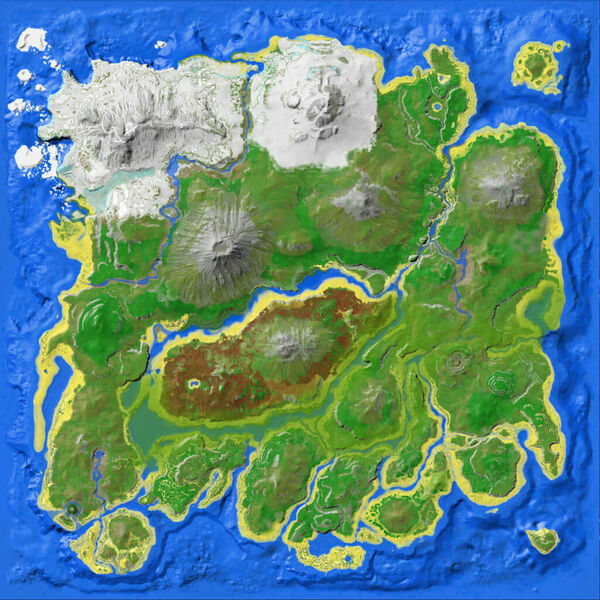 It has since been renamed to Winter's Mouth and changed to be snowy, so it now is an extension to the already-existing snow biome, the Whitesky Peak. This page was last edited on 18 December 2018, at 01:38.